The National Chairman of the All Progressives Congress, Adams Oshiomhole, has explained why he had been begging members of the R-APC not to leave the APC. He said that his action was not an act of cowardice. Oshiomhole, while speaking at the launch of a book by Senator Bukar Abba Ibrahim (APC, Yobe-East), pointed out that the appeal being made to the aggrieved members was all about restoring peace and getting justice for those who deserved it. He stated that it was not as a result of being jittery. Oshiomhole said, “Throughout the weekend and up till today (Monday), many of the national dailies reported different stories with the impression that I have not been sleeping within the last one week as a result of alleged midnight meetings with aggrieved party members, who they say I have been begging not to leave the party. “In some of the reports, the insinuations even went as far as saying that I made juicy offers to the aggrieved party members in stopping them from defecting. While I will not be too direct in reacting to such reports here, I will only say though I have been meeting aggrieved party members over whatever injustices they felt the party or some chieftains of the party had done to them. I have not been having sleepless nights as being reported, and also I am not in any way jittery. 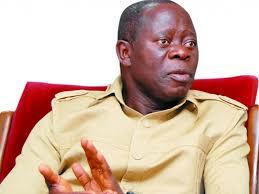 In its response, the PDP described the former governor of Edo State as fake. It said that while he boasted during the day, he would visit aggrieved members of the APC at night, begging them not to leave the ruling party. The National Publicity Secretary of the party, Mr. Kola Ologbondiyan, who spoke with one of our correspondents, said that both Oshiomhole and the national leadership of the APC had become jittery over the planned defection. He said, “We will rather forget and ignore him. He is a drowning man and his party will soon become the opposition party in Nigeria. That is why he’s busy running his mouth. “In day time, he goes out shouting, calling people names but at night, as from 2am, he goes about visiting and begging people he had abused, asking them not to leave and offering them positions and tickets.